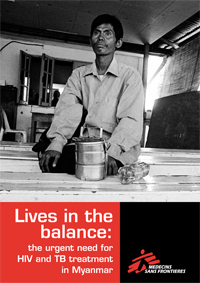 "Lives in the Balance" outlines the dire situation for people affected by HIV and tuberculosis (TB) in Myanmar. The UN estimates that over the last few years between 15,000–20,000 people living with HIV die annually in Myanmar, because of lack of access to urgent lifesaving antiretroviral therapy (ART). "Lives in the Balance" outlines the situation for people affected by HIV and tuberculosis (TB), with a special focus on multidrug-resistant TB (MDR-TB), in Myanmar today. It calls for urgent funding and assistance to be made available by the international donor community to help Myanmar close the devastating gap between people’s need and people’s access to treatment for HIV and TB. An estimated 120,000 people living with HIV/AIDS are in need of lifesaving ART in Myanmar. In 2010, according to national estimates fewer than 30,000 of these received it. Meanwhile, TB prevalence in Myanmar is nearly three times the global average, and the country has high levels of MDR-TB. The World Health Organization (WHO) estimates that there are 9,300 new cases of MDR-TB in Myanmar each year. By 2010, 192 MDR-TB patients had been started on treatment. Unpublished figures indicate that by the end of 2011, this had increased to over 300. This remains far short of what is needed. In 2011, following a five year absence, the Global Fund to Fight TB, AIDS, and Malaria restarted in Myanmar (in Round 9). The money allocated was crucial to laying the foundations for Myanmar’s efforts to provide treatment for HIV and TB. In expectation of further funding, the Myanmar Ministry of Health, and nongovernmental organisations (NGOs) have started to make credible efforts towards scaling up treatment. Then, in November 2011, just months after donors announced new HIV treatment targets, the Global Fund cancelled its next round of funding (Round 11). The loss of the anticipated funds for HIV and TB treatment is a tremendous blow to Myanmar, the least developed country in southeast Asia, and one of the lowest recipients of official development aid in the world. Myanmar has some of the lowest coverage rates for ART in the world. ART not only saves lives, it is now proven to be a critical tool for the prevention of HIV. Doctors Without Borders/Médecins Sans Frontières (MSF) is the biggest provider of ART in Myanmar. With more than 23,000 patients on lifelong ART, and with over 6,000 new patients to be enrolled in 2012, we are pushing the limits of our capacity. MSF always strives to provide ART across to our projects in line with international standards. In Myanmar, however, faced with overwhelming numbers of people in need of HIV treatment, and the few alternative sources available for them, MSF—like everyone else fighting HIV/AIDS in Myanmar—has to make tough choices about who we can treat. And who we can’t. Expected funds from the Global Fund's Round 11 would have paid for 46,500 additional patients on ART, helping to bring total coverage close to 100,000 by 2018 . By improving access to ART in Myanmar and supporting further efforts to prevent transmission, HIV in Myanmar can be stopped in its tracks. Meanwhile, another—often linked—crisis is raging: tuberculosis. HIV attacks the immune system. In doing so it leaves the body open to infection. In Myanmar, as in many developing countries, one of the first infections to take hold is TB. An HIV crisis therefore inevitably means a TB crisis. “Most of the people don’t know what it really means. That is why they have no fear about MDR-TB. They only fear HIV/AIDS. But this does not make sense. TB is transmitted easily through the air, HIV is not. No one knows who is suffering from TB. A 2010 survey by Myanmar’s National TB Program in conjunction with the WHO found a TB disease burden two times higher than anticipated. Based on the survey, estimates of the number of cases in 2010 may be as high as 300,000. Twenty percent of these cases are people living with HIV. A person with active but untreated tuberculosis can infect 10–15 other people a year. MDR-TB has the same airborne transmission as drug-sensitive TB, but is more lengthy and complex to treat, and difficult for patients to tolerate. It takes around two years to treat an MDR-TB patient, compared with the usual six months for non-resistant TB patients. During this time, patients have to take an even bigger cocktail of drugs, many with severe side effects. MDR-TB is a serious and emerging threat in Myanmar. Perfectly healthy people can contract MDR-TB. To prevent the unchecked spread of MDR-TB, exacerbated by HIV and a lack of availability of diagnosis and treatment, a significant mobilization of resources is needed. Instead anticipated funding is threatened and with it, tens of thousands of lives. The cancellation of Round 11 means that there will be no new funding opportunities to expand treatment for HIV/AIDS or for TB and its drug-resistant forms until 2014. Diseases don’t respect such delayed timelines. HIV and TB will continue to spread—unchecked—in many areas. The time to treat them is now. The math is simple. Rapidly scaling up HIV and TB treatment now will prevent further transmission and save both lives and money. Fewer people infected means fewer lives lost, and fewer people in need of treatment. This is a defining moment. Recent political reforms in Myanmar have been reciprocated by greater engagement from the international community. Donors have a real opportunity, and responsibility, to help build on those foundations laid to address the gap between need and access to treatment for those living with HIV and TB in Myanmar. Tens of thousands of lives are hanging in the balance in Myanmar, the decisions donors make are the difference between life and death. Increasing funding, both bilateral and multilateral, for HIV and TB programmes in Myanmar. Providing additional funding for the Global Fund in 2012, and actively encouraging other donors to do the same. Supporting the Government of Myanmar in taking the necessary steps to facilitate the planned scale up of HIV and TB treatment. The Global Fund must ensure adequate funding allocations for Myanmar. International NGOs must play their part, and increase support for HIV and TB treatment in Myanmar. MSF is encouraged by the recent efforts by the Government of Myanmar to increase the health budget and hopes this will continue. The Ministry of Health needs the resources to provide necessary health care to the population, inclusive of HIV and TB treatment. MSF asks the Government of Myanmar to continue to support the process of decentralising lifesaving ART and MDR-TB treatment by facilitating increased geographic access, and through simplifying operational constraints such as importation procedures.